For all of its shortcomings (unbearable heat and humidity), summer is my very favorite time to be a baker. I am so inspired by the amazing variety of fruit available during the summer months, so when I was tasked with making some desserts for a photo shoot a few weeks ago, I knew that fresh fruit tarts would be just the thing. 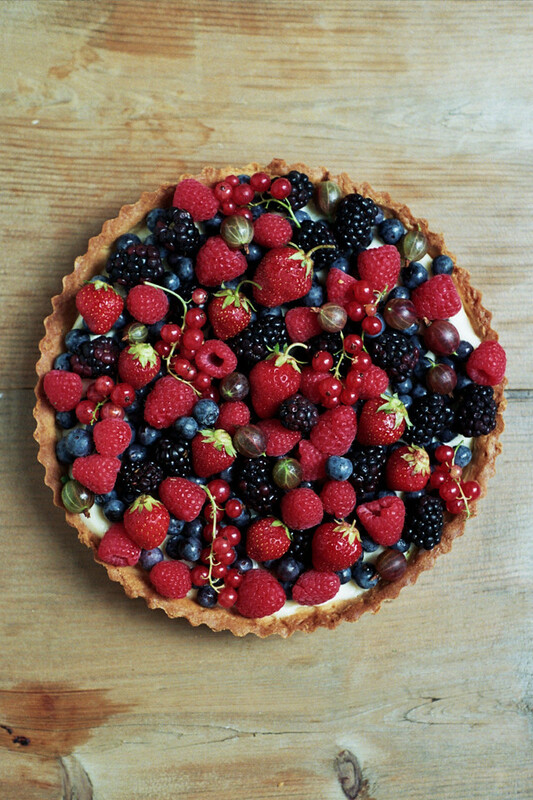 I used my favorite sweet tart shell from Dorie Greenspan filled with a luxurious mascarpone cream that I developed a few months ago when a friend tasked me to make her wedding desserts, then I topped it with heaps of the most beautiful berries I could find. I love recipes like this cream because they are a great, neutral base to showcase whatever fruit is in season. Now that we are later into the summer, I think some sliced stone fruit tossed in lemon juice or assorted cherries would be lovely. As always, use whatever is in season and beautiful at your local market. 1. In the bowl of a food processor or with a pastry blender, combine the flour, sugar and salt. Pulse to combine. Add the butter and pulse until the butter is the size of small peas. Add the yolk and pulse then stream in the water and mix until the dough starts clump together. 2. Lightly butter your tart pan or pans and gently press the crumbly dough into the pan. Make sure to evenly coat the bottom and the sides while being careful to not compact the dough too much. Alternately, you can pat the dough into a circle, wrap it in plastic, and chill it for 2 hours. After 2 hours, roll the dough in between two lightly floured pieces of parchment paper into a 12'' circle and gently lay it into the pan, making sure to press the dough gently into the sides and bottom of the pan. You may have a bit of extra dough, save it just in case you have to repair any cracks later on. Use a fork to poke holes in the bottom and sides of the dough. Freeze the tart shell(s) for 30min. This cream is a heavenly combination of whipped pastry cream, whipped cream, and mascarpone cheese. I use the pastry cream recipe exactly as written on BraveTart.com so I have linked to it below instead of reposting the entire thing here. 1. Prepare the pastry cream and chill thoroughly. 3. In the bowl of a stand mixer, whip the chilled pastry cream until light and fluffy, about 5 minutes. Add the mascarpone and whip until well combined. Fold in the whipped cream and chill the mixture until ready to use. 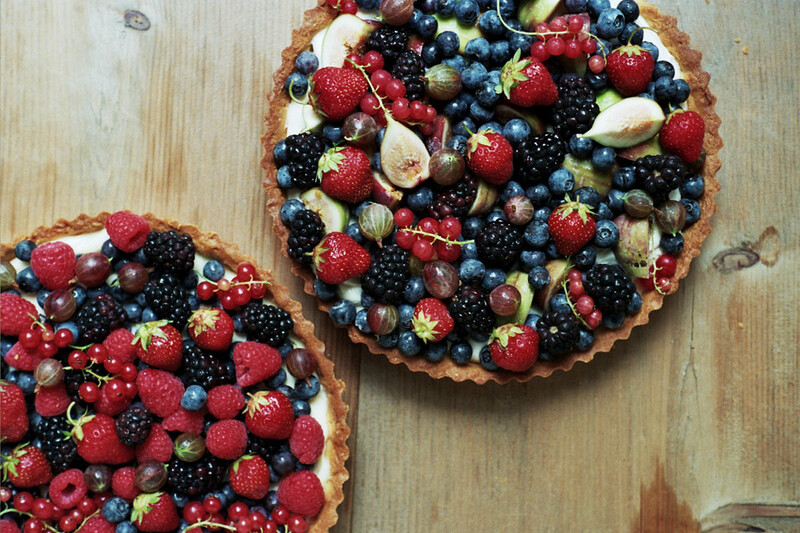 For the tarts above I used blueberries, blackberries, strawberries, raspberries, currants, figs and gooseberries, but use whatever is fresh and beautiful in your market. 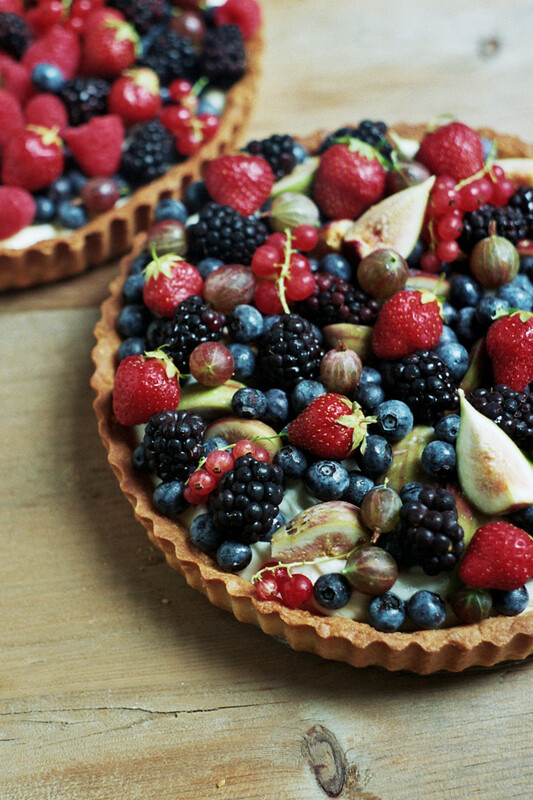 Gently spread the mascarpone cream into the tart shell (you may have a bit extra) and top with fresh fruit. Serve immediately. This tart is best on the day that it is made, but it will last a day or two in the fridge if you don't mind a soggy crust.